Booking Includes: This includes your boat, maps, all paddling equipment, safety briefing, bank tuition and camping fee's, your own private clearing complete with logs around the campfire and a loo-with-a-view! Luggage Service and tent with will be already put up in your given camp clearing. This is a fantastic canoe and camping trip for those who want to experience the best of the river and woodland camping, sandwiching a longer day followed by a shorter one as a reward. We will meet you in Bedford behind Longholme Café and Boating Lake, kit you out in paddling equipment before giving you full bank tuition and then you are ready to set off. You will leave your Luggage with us, and it will be dropped off into your camping clearing ready for when you arrive. 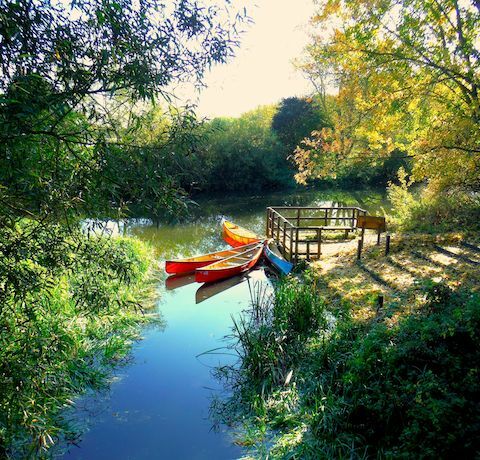 After a stunning paddle through the countryside you will arrive at Matchstick Wood, on the banks of the river Gt Ouse. You will get your own private clearing in the woodland, complete with long drop loo, luggage store and most importantly the campfire, to sit around under the starry night sky. Your tent will be already pitched, allowing you more time to enjoy the roaring campfire with the wine/ beer cooling in the brook this trip will seem like the ideal tonic to a busy life, allowing you to spend some quality time in the great outdoors. You will have you boat ready on site for the following day, so you can get back on the water and enjoy some time with nature. As your final destination is just a short paddle, why not round off your experience by arriving early and booking lunch at the pub on the river bank, before we come and collect you.